Tony Awards 2018: See all the best red carpet looks! These red carpet looks deserve a standing ovation! Stars were dressed to impress at the Tony Awards! Celebrities stepped out to celebrate the best of Broadway at the 72nd Annual Tony Awards at Radio City Music Hall in New York City on Sunday. Bold, cheerful florals popped up everywhere this year with stars like Carey Mulligan, Rachel Brosnahan and Anna Wintour embracing looks that echoed the red carpet’s rose-covered wall. Long-sleeved dresses were also a big trend along with metallic dresses and chic pantsuits. Here are some of the best looks from the red carpet. Fey, whose musical adaptation of “Mean Girls” was up for several Tony Awards, glittered in a feathered, silver gown. 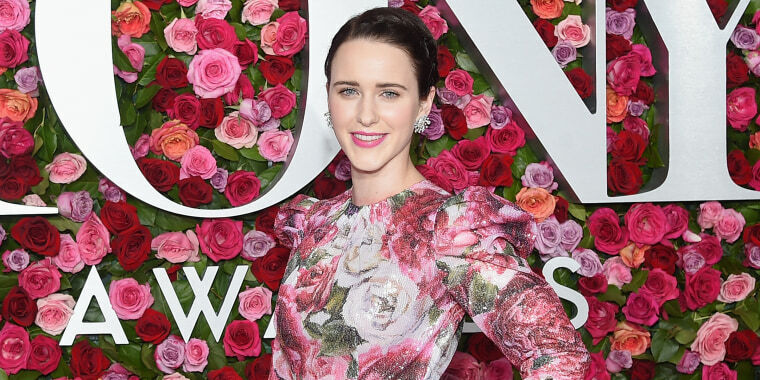 The “Marvelous Mrs. Maisel” star looked stunning in a long-sleeved, floral Dolce & Gabbana gown, which happened to coordinate perfectly with the wall of roses behind her. The Broadway legend looked beautiful in a sleek, off-the-shoulder red gown with an embellished, sheer wrap and coordinating red handbag. Rivera was honored with a special award for lifetime achievement in the theater. The singer, who co-hosted the 2018 Tonys with Sara Bareilles, had fun with color on the red carpet, wearing a bright purple suit with a silver bow tie and tortoise-rimmed glasses. His girlfriend, actress and writer Schuyler Helford, looked stunning in a blush pink gown with a long train. The Boss looked dapper in an all-black suit while his wife, singer-songwriter Patti Scialfa, looked elegant in a white gown with a black, feathered clutch. Springsteen was honored with a special Tony for his show, "Springsteen on Broadway." The actress, who is currently playing Eliza Doolittle in the Broadway revival of “My Fair Lady,” wore a beautiful Oscar de la Renta gown with whimsical, bird-themed embellishments. The “Mudbound” star looked elegant in a chic, floral dress paired with a swept-back bob and simple stud earrings. The actress looked stunning in a strapless Zac Posen gown with delicate, floral detailing down the waist. The “Waitress” star paired with look with a chic, blunt bob with bangs. The icon struck the perfect note (as always) in her belted yellow dress with floral embellishments that echoed the flowery wall on the Tony's red carpet. The “Orange is the New Black Star” looked gorgeous in a marigold halter-top gown with gold earrings and metallic sandals. The “Unbreakable Kimmy Schmidt” star arrived on the red carpet with Pablo Salinas in a red tuxedo with a black bow tie. The “Good Fight” actress embraced the pantsuit trend with this crisp, white ensemble paired with a white clutch and silver heels. The actress and comedian wore a long, black gown in a classic silhouette. The "Homeland" actress looked fierce in this long-sleeved, leopard print number from Valentino. Singer Sara Bareilles, accompanied by her boyfriend, actor Joe Tippett, looked glamorous in a tiered, copper-hued gown with a plunging, embellished bodice. Bareilles co-hosted the show this year with fellow musician Josh Groban. The “Girls Trip” star glowed in a metallic Michael Kors Collection pantsuit, accessorized with glittery Chopard earrings and a black clutch. The star of Broadway’s “Mean Girls” looked stunning in an orange, pink and white Christian Siriano gown. Louderman scored a Tony nomination for best actress in a musical for her role as Regina George in the adaptation.